The current “Great Return March” is not the first attempt by Palestinians to “return” to Israel by pretending to peacefully march through the Israeli borders. In 2011, there were two sets of similar demonstrations or attempts, in May and June for Nakba Day and Naksa Day. Arabs of Palestinian descent attempted to walk into Israel from Lebanon, Syria, Jordan, Egypt, as well as Gaza and the West Bank. In most cases, the demonstrators were not stopped by Israel, but by the police and armies of the host countries and territories – often violently. On May 15, the Lebanese army fired at the demonstrators, killing 10 of them. The Egyptian army stopped any buses with demonstrators before they could approach the border, and in Jordan dozens were injured as the Jordanian security forces stopped the demonstrators from approaching the border with Israel. If these were peaceful protests, then why would the host countries be willing to use violence to stop its own citizens from approaching Israeli territory? During the June 5 demonstrations, even Hamas stopped the protesters from approaching the Gaza border by putting up checkpoints and arresting those who tried to bypass them. What was so obvious in 2011, that attempts to breach a border are acts of war that can be expected to be met with deadly force, has suddenly become controversial in 2018. It is also notable that Israel used the exact same methods to stop the protesters in 2018 as in 2011: warning them, using tear gas, and shooting at their legs when the other methods didn’t work. There were no condemnations from the international community then, and as we’ve seen even Lebanon and Jordan and Egypt – and Hamas – attempted to stop the protests, with violence if necessary. The international reaction to the current wave of violent riots is the height of hypocrisy. Israel “undoubtedly” serves as a model for securing America’s borders, said Senator Ted Cruz (R-TX) during an interview on Breitbart News Sunday. As one of Congress’s most vocal advocates for the Jewish State, Cruz called the relocationof America’s embassy, as required by a 1995 law, a “momentous occasion.” Both the United States and Israel herself recognize Jerusalem as the capital, but until Monday, the U.S. had kept its embassy with most other countries in Tel Aviv. Cruz’s comments came in the context of weeks of ongoing Hamas rioting conducted with the explicit aim of breaching Israel’s border, provoking deadly Israeli responses. On Monday, as celebrations were taking place in Jerusalem, roughly 60 miles south, deadly clashes between a Hamas-organized march and the Israeli Defense Force left dozens dead, according to Hamas-controlled medical authorities. The events of the day gave a new relevance to Cruz’s remarks on Israeli border policy. 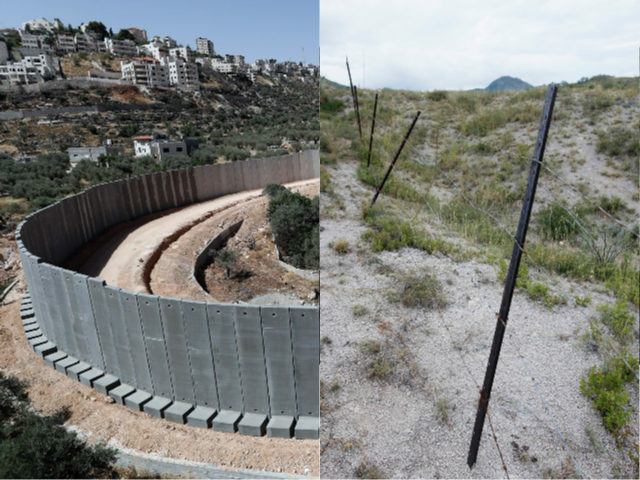 In the years before this eruption of violence, Israel instituted a strategy of border walls that has proven highly effective in stopping crossings by Palestinian Arabs and have cut backdramatically on the terrorism that was once pervasive in Israeli society. President Trump, on the campaign trail, made frequent reference to the existence and efficacy of Israel’s extensive, manned walls as he pitched his own plan for a U.S.-Mexico border wall. It took Soleimani’s Iraqi minion and his heavily armed convoy a couple of days to cover 300km from Iraq to Beirut. This is exactly the distance Iranian and Hizballah forces cover on their way from Iraq to the Mediterranean. The tour that wound up Khazali’s trip took place on the south Lebanese road parallel to Israel’s northern border. That road is just 65km long. At several points on his itinerary from Iraq, he must have been sighted. It is hard to understand why no American force in Syria and no eyes along the Israeli-Lebanese border missed sighting his armored convoy and failed to take him out – and so cut short Tehran’s deadly, well-advanced conspiracy to unleash thousands of ferocious Iraqi Shiite militiamen against Israel. By reaching the Lebanese-Israeli border on Dec. 2, Iraqi Shiite militia chief Qais al-Khazali embodied the consummation of Iran’s open land bridge to the Mediterranean. The mission that Iranian Revolutionary Guards Al Qods chief, Gen. Qassem Soleini entrusted to Khazali and his militia, Asaib Ahl al-Haq (the League of Believers), embodies Iran’s success in gaining its great ambition of an overland corridor under its control through Iraq up to the Mediterranean coast. In line with that mission, the militia chief was guided along the Lebanese-Israeli border on Dec. 2, for a sight at close hand Israel’s border towns from Admit in the west to Metullah in the east. He needed this information in order to mark out the military positions he would assign to his Khalazi network at Tehran’s behest. This event most of all highlighted American and Israeli inertia in letting Iran consummate its prime strategic goal of opening up new fronts against Israel from Lebanon and the Syrian Golan. They are to be manned not just by Hizballah, but by many thousands of battle-hardened Iraqi militiamen devoted to Tehran, as the Khazali odyssey has revealed. DEBKAfile’s military and intelligence sources tracked his itinerary from the crossing into Syria from Iraq on Thursday, Nov. 30. His first stop was at Soleimani’s headquarters east of Abu Kamal. There, he conferred with the Al Qods chief and his operational staff, as well as with officers of his own militia who were fighting in Syria. They discussed ways and means of transferring 15,000 militiamen from Iraq to Lebanon via Syria for taking up deployment in southern Lebanon along the Israeli border. On Dec. 1, when these matters were settled, Khazali set out for Damascus, escorted now by Hizballah in a heavily-armored convoy. There, he reported to the new headquarters set up by his militia in partnership with the Iraqi Kata’ib Hezbollah, the backbone of the Iraqi Popular Mobilization Forces (PMU). It is commanded by Soleimani’s deputy, Abu Mahdi al-Muhandis. Our sources report that this headquarters was recently established in Damascus to coordinate the Syrian- based Shiite militias, including those imported from Pakistan and Afghanistan, for a concerted campaign against Israel. Khazali’s convoy then drove west, crossed the Syrian border into Lebanon and drove on to Beirut for a meeting with Hizballah’s leader Hassan Nasrallah. The two terror chiefs ironed out all the details pertaining to the disposition of the Assaib Ahl al-Haq militia in southern Lebanon across from northern Israel’s Galilee. Our military sources report that that the militia chief was then taken on his tour by Hizballah for surveillance of Israeli military formations on the other side of the border, so as to arrange the positioning of his forces accordingly when they arrived in Lebanon. The tour began at the Hizballah position facing Israel’s Admit, continued to Houla, west of which Hizballah has planted a position opposite Israel’s Manara ridge and the IDF post located there. His next stop was Kafr Kela, just one and a half kilometers from the northernmost Israeli town of Metula. From a nearby Hizballah position, he was able to view the Golan and Hermon slopes. The voice of a Hizballah officer could be heard on a video clip released in Iraq on the militia chief’s tour. He was saying: “This is Golan. It is nearly 10 kilometers from here.” Khazali then proceeded on foot with his escorts to the Fatima Gate on the Lebanese-Israeli border outside Metula. How did Ms. Nauert display “ignorance” according to Ben-Ami? Ben Ami attacked Ms. Nauert because she wouldn’t officially “endorse” the Two-State solution, J Street’s central policy. The American Jewish Left is now attacking the Trump Administration because it appears not to be actively forcing Israel into the 1967 Auschwitz borders. J Street’s attack on Trump only proves two things: 1) J Street ‘s agenda is the destruction of Israel, and 2) that President Trump may be on the right track of protecting Israel from a Two-State annihilation. First, Ben Ami’s declaration that President Trump is “an obstacle to peace” is not a badge of dishonor, but a crown of holiness. Why? Because, up to now, the Israeli and American Leftists two-staters have called Israel’s ‘settlers,’ Israel’s greatest heroes, “obstacles to peace.” Israel’s settlers are Israel’s greatest heroes because they have put their bodies and their family’s lives on the line to protect Israel from a ‘West Bank’ Palestinian State that would rain katyusha rockets into the highly and densely populated Tel Aviv-Hadera Sharon Coastal Plain. Israel’s ‘settlers’ have endured Israeli Leftist attacks and Palestinian terrorist murders to protect the Nation of Israel. The fact that many Israelis don’t understand the ‘West Bank’s vital military value to Tel Aviv doesn’t mean Israel’s ‘settlers’ aren’t heroes. It only proves the Jews living in Judea and Samaria are modern-day super-heroes for enduring the vile attacks from their fellow Jews while they sacrifice everything for the greater good. Hence, for President Trump to be called an “obstacle to peace” by the Jewish Left is medal of supreme greatness. A “failed” “strategic experiment”? Between 2001 and 2005, there were hundreds of rocket and mortar attacks on pre-1967 Israel from the Gaza Strip. Any moron, let alone rational military general, could have figured out that when Israel unilaterally retreated from Gaza without any agreement in 2005, there would an escalation of the rocket attacks into Israel. Instead of the Israeli Left-wing understanding the reality and danger of the Gaza rockets, they deluded themselves into the group-think that everything would be just fine. Israeli left-wing politicians should be put on trial for their 2005 Gaza Disengagement lunacy. Instead, they are voted in as Knesset members, and allowed to continue to ply their national-suicidal plans. It’s only because the land around the Gaza Strip is sparsely populated and the Jews in the south relatively poor that the Palestinians are allowed to rocket them. If those same rockets hit the wealthy areas of Tel Aviv, the “West Bank” Palestinians would be destroyed, and the whole world would accuse Israel of war crimes at the Hague. That is until the United Nations fielded a “peace-keeping” force to protect the “West Bank” Palestinians while the Palestinians lobbed the Katyushas over their heads into Tel Aviv. Ben Ami is either totally ignorant of the reality of Palestinian Gaza rockets hitting Israel, and the obvious analogous danger to Tel Aviv, or Ben Ami wants the same Gaza type rockets to be smuggled into the ‘West Bank’ and fired into Tel Aviv. Let’s agree, for the sake of this discussion, that Ben Ami isn’t ignorant of the Gaza rockets. That means Ben Ami, a leftist American Jew, sitting all protected and safe in America, wants the Palestinians to be able to fire rockets from the ‘West Bank’ Palestinian state into Tel Aviv. In such case, J Street and Ben Ami are self-hating Jewish enemies of the Israel and the Jewish people. In conclusion, J Street and Ben Ami’s attacks against President Trump are badges of highest honor for President Trump. For, there can be no higher honor for anyone than to be placed in the same class as the brave and heroic Israeli residents of Judea and Samaria who are, at this very moment, protecting the Jewish people with their own bodies and their own families. In fact, it’s fair to say they we all are praying that President Trump becomes as great a hero to Israel as the ‘settlers’ are heroes to Israel. Prime Minister Binyamin Netanyahu set out for President Vladimir Putin Israel’s red lines against Iran establishing a permanent, expanded military presence in Syria. This theme dominated their three-hour conversation in Sochi on Wednesday, Aug. 23. Netanyahu stiffened his warning with a veiled threat that should Iran or Hizballah cross those lines, there would be a regional war. It was the first time that the prime minister had publicly threatened to go to war against Iran and Hizballah. After talking to Putin, he said to reporters that what is new today is Iran’s attempt to “Lebanonize Syria.” in the same way as it seized control of Lebanon through its surrogate, Hizballah. “We are looking at Tehran’s future takeover of Syria through its Shiite militias. If that happens, “we will not remain passive,” he said – nor if Syria becomes a link in Iran’s overland corridor via Iraq and Syria to Lebanon. And we certainly can’t accept Iranians and Hizballah close to the Golan. “We told President Putin plainly that we won’t put up with Iran using Syria as a military base for attacking Israel. Putin, in the part of the meeting to which reporters had access, did not address Netanyahu’s remarks about Iran’s role in Syria, nor his warning of unilateral military action. The Russian president just repeated the standard Moscow line that foreign forces would not stay in Syria at the end of the war, but offered no timetable or guarantees. The Russian leader would clearly prefer not to see an Israel war against Iran and Hizballah breaking out in Syria, DEBKAfile’s sources say, especially since Russian special forces, naval and air force contingents are deployed there – albeit not in large numbers. At the same time, he may well find Netanyahu’s strong words useful for boosting Russia’s clout in Syria. If Tehran believes an Israeli war against its forces and Hizballah is potential, it will be in Iran’s interest to strengthen its military ties with Russia so as to gain its military and political backing. For Putin, this would be a welcome change from the atmosphere of acrimony prevailing for some weeks between Iranian and Russian officers in Syria. Russian colonels have been posted at the most sensitive sectors in Syria, such as Aleppo, Hama, Homs and eastern Damascus. They are taking over both the military and civilian administration there and, in effect, shouldering the Iranian officers aside. In Iraq, the Iranians seized control of the country from within, by setting up armed militias and getting them integrated in the national army, as Trojan horses. Tehran knows how to manage this ruse on the quiet, without drawing unwanted attention from the powers on the spot. In Syria, the problem facing Israel is quite different. If Netanyahu shared sensitive intelligence with Putin that he had not known before, he can’t help noticing that Israel’s red lines for Iran’s expansion were crossed months ago, some of them with Russian assistance. 1. Iran and Hizballah have already set up a chain of military bases in Syria – notably in the Qalamoun Mountains on the Syrian-Lebanese border, from which missiles can be launched against Israel. 2. Iran has already won its coveted land bridge through Iraq to Syria. Bashar Assad’s army has taken over whole sections of the Syrian-Iraqi border, and opened the door for pro-Iranian Shiite militias, Hizballah and Iraqi Shiite groups to move into strategic positions on both sides of the border. 3. Netanyahu warned of the danger of planting an extremist Shiite entity in the heart of the Sunni Muslim region. But this is already underway. On orders from Moscow, the Syrian army’s 5th Corps is in the process of absorbing the pro-Iranian Shiite militias which fought for Assad. The prime minister did not inform Putin of any timetable for Israeli action. But the Russian leader will take it for granted that the Israeli army will not move into Syria without a nod from the Trump administration in Washington. For now, Putin and Trump are synchronizing their operations in Syria with better results than Netanyahu’s understanding with the US administration. Local US-backed Syrian rebel groups disbanded without a shot, went over to the Syrian government side and handed in their US-supplied weapons to Syrian army and Hizballah fighters. Sooner or later, the Sweida model will be replicated in Quneitra. Neither the Russian troops nor UN peacekeepers will fight to stop it happening. By then, the Syrian rebel groups, in whose support Israel invested for years as a buffer against hostile Syrian, Iranian and Hizballah forces, are already falling apart. Disowned by their Saudi backers, they are being crushed by the US-Russian “de-escalation” steamroller. Israel like Jordan will soon find three hostile forces sitting pretty just across its border, far too close for safety. The transformation of a small, strategic wedge of land between the Syrian, Israeli, Jordanian and Iraqi borders is going forward apace without arousing much interest – even in Israel, where it should cause the most concern, DEBKAfile reports. On Wednesday, Aug. 8, two Russian army companies of Ingushet troops from the northern Caucasus set up a command post in the Syrian village of Tal al-Shahm, 13km from Israel’s Golan border. Its commander, Col. Alexei Kozin, has thus taken charge of Syria’s border with Israel. As DEBKAfile reported last month, his task is to set up 10 control checkpoints along that border. This border area was designated as one of four de-escalation zones agreed on between Presidents Donald Trump and Vladimir Putin at their meeting in Hamburg on July 7. According to understandings reached between Washington, Moscow and Jerusalem, the UN separation force (UNDOF) will return to its Fawar base opposite Quneitra as a buffer between IDF and Russian forces. Its past history in this role between IDF and Syrian forces was never exactly impressive. A piece of diplomacy consistent with this process was contributed by Russian foreign Minister Sergey Lavrov on Friday, Aug. 11. It was an assurance that Russia would take into account Israel’s interests in Jerusalem in the framework of Israeli-Palestinian peace talks. It also fits in with the surprising statement from Washington on the same day, namely, that Donald Trump, although in the midst of a fearsome crisis with North Korea with military overtones, is planning to send his senior adviser, son-in-law Jared Kushner and Israel-Palestinian peace broker Jason Greenblatt, on an early visit to the Middle East to continue this mission. To see how these disparate elements fill out the whole picture, we turn 70km east from Quneitra on the Syria Golan to the battles ongoing at Sweida in southeastern Syria opposite the Jordanian and Iraqi borders. Russian troops moved into the key town of Daraa, abutting on the Jordanian border on July 13. Like in Quneitra, a month later, they set up command posts to monitor the first de-escalation or ceasefire zone to be set up under the Hamburg accord. The Russian troops’ assignment was to stop the fighting there and execute the withdrawal of the combatant forces, the Syrian army, Iran, and its foreign Shiite militias, including Hizballah, to a distance of 40km from the border. But that arrangement never stood up. Nearly four weeks later, on Wednesday night, Aug. 9, on the same night that Russian troops moved into Quneitra, the Syrian army and Hizballah launched a major offensive in Sweida province. Three days later, by Saturday, they had forced the local rebel forces to retreat into Jordan and seized 57km of Syria’s southern frontier with the Hashemite Kingdom. Neither the Russians nor the American interfered with the Syrian-Hizballah-led push, although the Russians took responsibility for maintaining the ceasefire, and US special forces were and still are posted to the east of Sweida at Al-Tanf in the Syrian-Jordanian-Iraqi border triangle. DEBKAfile’s military sources add that the Syrian-Hizballah offensive violated the ceasefire deal. Local US-backed Syrian rebel groups disbanded without a shot, went over to the Syrian government side and handed in their US-supplied weapons to Syrian army and Hizballah fighters. The Sweida episode demonstrated how the Syrian-Iranian-Hizballah alliance sees its way to using the Trump-Putin ceasefire zones accord as an open door for seizing control of southern Syria and grabbing the Jordanian and Israeli borders. The Syrian rebel movement is disintegrating at an alarming rate following the “Jubeir earthquake,” as it has become known – another momentous event which Western and Israeli front pages have chosen to ignore. Last week, Saudi Foreign Mniser Adel al-Jubeir reportedly informed a delegation of Syrian opposition leaders invited to Riyadh that his government was pulling its support from their fighting militias, in the wake of President Trump’s decision to reduce US military action in Syria solely to the war on ISIS – and therefore end US resistance to the Assad regime. But meanwhile, the decisions by Riyadh and Washington to abandon the anti-Assad cause spread like wildfire among Syrian rebel groups. Many responded by laying down their arms and surrendering. The fate of the rebel movement after six years of cruel warfare against the dictator Bashar Assad should be an object lesson to other recipients of American and Russian promises. Therefore, Lavrov’s pledge to take Israel’s interests in Jerusalem into account should be taken with a pinch of salt. He was most likely shooting a line to allay Israeli skepticism about the prospect of Russian troops keeping Syrian, Iranian and Hizballah troops at bay from its northern border – even through this pledge was underwritten by Washington. Instead of taking the two powers at their word, Israel need only watch what is going on in the last few hours just across the border at Sweida, to appreciate the value of such promises. DEBKAfile’s sources report that the Russians suggested that the discussion be held over for the next session. They then took the Americans by surprise by relocating the sixth session of the Astana conference to Tehran. This too was a measure of the conference’s breakdown as a peace forum. US, Jordanian and Syrian rebel opposition groups will never travel to the Iranian capital to negotiate an end to the Syrian war. The ceasefire was supposed to be in effect until midnight on Thursday, June 6, but there is now a possibility that the fighting will resume earlier, perhaps even in the coming hours. The fifth round of Russian-initiated Syrian peace talks taking place Tuesday, July 4, in the Kazakh capital of Astana was designed to prepare the ground for the Trump-Putin summit Friday on the sidelines of the Hamburg G20 summit, by laying out proposals for deconfliction zones in Syria. To support this move, Moscow twisted the Syrian ruler Bashar Assad’s arm to declare a unilateral ceasefire in southern Syria. However, the ploy was soon aborted. The Astana conference quickly broke down when Iran and Turkey, two of the three sponsors along with Russia, rejected the formula for deconfliction zones on Syria’s borders with Iraq, Jordan and Israel, DEBKAfile’s sources report. Present at Astana along with the three sponsors were leading Syrian opposition and rebel groups, as well as UN envoy for Syrian affairs Staffan de Minstura, US Acting Assistant Secretary of State for Near Eastern Affairs Stuart Jones, and Jordanian Foreign Ministry adviser Nawaf Uasfi Tal. The Iranina and Turkish delegates had no objections to the two demilitarized zones proposed for the Damascus and Homs areas, but withheld their consent for the zones in eastern and southern Syria, and refused to accept the formula for forces policing the latter deconfliction zones, their identity, powers as truce monitors and the types of arms they were allowed to carry. Iran and Turkey demanded the deployment of their own troops along with Russians in the two safe zones, which border on Israel, Jordan and Iraq, and wanted them armed for “self-defense.” The representatives of the US and Jordan refused, proposing instead that an international force be established to supervise the zones. Turkey and Iran rejected this out of hand. By knuckling under to Tehran on this venue, the Russians have shown their hand as supporters of Iran’s military objectives in Syria, which they have hitherto tried to disguise. The failure of the Astana peace track calls into question the ceasefire declared on Sunday by Damascus on all the warfronts of southeastern Syria, including the battle for Daraa, 1 km from the Jordanian border, and the fighting for the Quneitra region, just 3 km from Israel’s Golan. That front was the source of the mortar shells that strayed across the border into the Golan last week.